Essential nutrients are those that must be provided through a balanced diet as the body cannot make them or make them in sufficient amounts. Every food we eat is made up of nutrients. Trying to get teenagers to understand the importance of eating key nutrients and what they do for our bodies can be challenging as there is so much information and sometimes only a limited time in which to teach it. So in order to give students an overview of the key nutrients without taking several weeks to cover the materials, I developed a combination of teacher directed and student directed activities. To help students understand the amount of nutrients in the foods they choose, I have students participate in a Tater Topper lab and then “Profile Their Potato” for essentials nutrients using the My Recipe portion of Supertracker. 11.3.9 D Analyze relationship between diet and disease and risk factors (e.g., calcium and osteoporosis; fat, cholesterol and heart disease; folate and birth defects; sodium and hypertension). 11.3.9 E Analyze the energy requirements, nutrient requirements and body composition for individuals at various stages of the life cycle. Show students the PPT slide of deficiencies and excesses and ask them what they are and what causes them. Discuss whether these health and nutrition ailments preventable. If so, how? So what makes a healthy person? Discuss that good nutrition makes a healthy person and this begins with a healthy diet. A healthy diet needs to include the six essential nutrients: Carbohydrates, Fats, Protein, Vitamins, Minerals and Water. To give an overview about nutrition show the Bill Nye The Science Guy: Nutrition video. Create a “Pac-Man” style foldable for the Nutrient Chain Foldable assignment using six different colors of copy paper and glue. 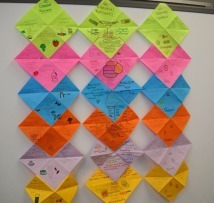 Attached you’ll find a PPT demonstrating the paper folding compliments of FACS teacher Sharon Allen of Indiana. Once assembled, it’s time to go over the requirements. Our school has a community portal that teachers can post templates, assignments and PPTs for students to access from home or school. Since I wanted students to be more self-directed with their notes, I had them work through the PPT and take notes on their own instead of me lecturing. They were instructed to ask questions if they did not understand and then we discussed it. This foldable Nutrient Chain will be their working resource of information for upcoming assignments and tests. I like to attach labs to nutrition topics when I can so I decided to do a Tater Toppings style lab where students prep their potatoes the day before, and select topping choices (this helps me know how much to purchase). The next day I bake the potatoes so they are ready for class. Student lab groups prepare the toppings for the actual buffet or “bar”. As students choose their toppings they are to document the amounts they take of each topping and there are limits to how much they can take. For the follow-up lab assignment, students must “Profile their Potato” by analyzing it’s nutritional value through the “My Recipe” section of the SuperTracker site. After they get a nutritional printout of their potato recipe, they complete a short writing assignment. For review students complete the “Nutrient Sort” and “Nutrient Match -Up” which are based on the information in their nutrient chain foldable. What size square do you start with on the foldable? My squares are usually 8.5 inches. It allows plenty of room for all of the notes and pictures but folds up small for storing in their folders. Kim…This is Misty Green from Northside Middle School in Muncie, IN. We have corresponded via the listserv before. I have to tell you, I am trying this with my kids tomorrow. I am excited to use it…..wish me luck! Good luck!! Wanted to mention that the Bill Nye link is disabled but I believe this video is still on SchoolTube. This looks so awesome! Thank you so much for sharing! This has been an amazing lesson for my kiddos! We are going to be doing the lab this week! Did you use raw vegetables for the toppings or cooked? And did you teach knife skills for the "taters"
Thank you! I use frozen veggies and cook them prior to the topping buffet. I incorporate knife skills into another lesson/lab, but it certainly could work for this one.